While there weren’t any rockfall events to rival the big one in 2017, there was still plenty of stone cascading from the Valley walls. Yosemite Valley. Photo: Rachot Moragraan. Yosemite faced a number of challenging events in 2018, including floods and fires, but fortunately serious rockfalls were not among them. 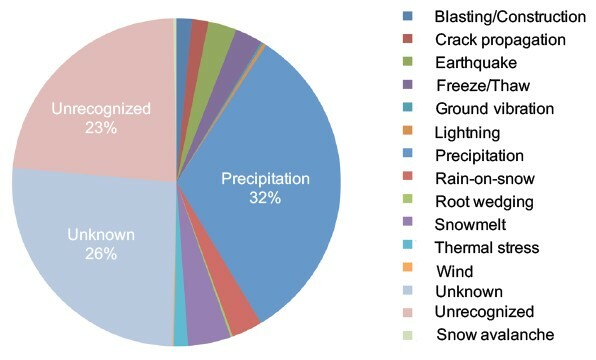 Forty-one events (including rockfalls, rockslides, and debris flows) were documented in 2018, below the recent average of 53 events per year (2006-2017), and less than half of that documented in 2017. Rockfalls in 2018 had a cumulative volume of about 2,220 cubic meters (6,610 tons), also well below the recent average of 10,068 cubic meters (about 30,000 tons). 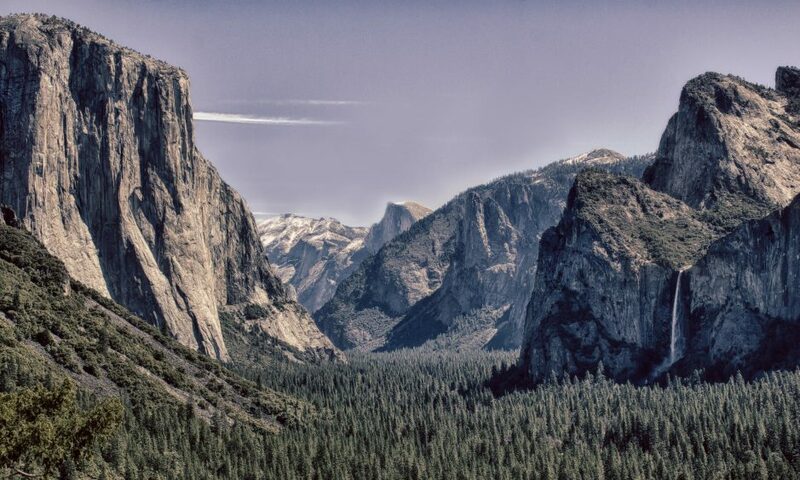 The largest rockfall of 2018 was not in Yosemite Valley proper, but instead occurred deep within the Grand Canyon of the Tuolumne, between Muir Gorge and Pate Valley. It likely occurred sometime in March with the first real winter storms, but it wasn’t reported until the trail was accessible in early summer. Approximately 1,500 cubic meters (4,465 tons) of rock slid off the north wall of the canyon, spreading out over the canyon bottom and burying the trail under large boulders and trees. Clearing the trail of this debris was a summertime priority for trail crews. Rockfalls by month for all of Yosemite National Park, 1857-2011. Credit: Greg Stock. The most consequential rockfall of 2018 was a relatively small rockfall from the northwest face of Half Dome. On the morning of June 5, a thin exfoliation slab of about 5 cubic meters (15 tons) fell from the east side of the face, breaking into many small fragments that funneled down a steep gully containing the lower pitches of the Regular Northwest Face route. The debris struck a climbing party on the third pitch, causing a neck laceration and possible dislocated shoulder. The climbers’ helmets sustained significant damage, suggesting that wearing helmets probably saved their lives. The injured climbers rappelled to the base of the route and were evacuated by helicopter. Yosemite rockfall triggers. Credit: Greg Stock. It is very likely that there were additional rockfalls and rockslides in 2018, but these events either were not witnessed or went unreported. If you witness a rockfall of any size, encounter fresh rock debris, or hear cracking or popping sounds emanating from the cliffs, please contact park geologist Greg Stock at 209/379-1420 or by email at greg_stock@nps.gov, or contact Park Dispatch by dialing 911 within the park. Documented rockfalls are added to the park database, enabling long-term evaluation of rockfall activity to improve public safety.